Feel for yourself. Start a free trial. See for yourself. Watch the video. We know your customers expect a high-end restroom experience. Our luxurious hand towels deliver complete comfort in a way you can feel good about. Comfort and image go hand-in-hand. It’s why our high-end towels offer both superior softness and a better user experience. So your restroom makes an impression you and your customers can feel good about. High-end restrooms demand high-performance. 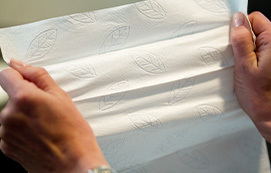 That means stronger, more absorbent towels to help customers dry their hands completely. It also means peace of mind knowing your restroom can handle high-traffic use with ease. Our towels are held responsible. Blending soft and renewable layers, we customized our high-end collection to deliver true, sustainable comfort. And one-at-a-time dispensing can reduce waste, leaving a positive impression on customers and minimizing the impact on our planet. Our high-end collection comes in a range of quality tiers to complement any restroom. With a variety of sizes and folds to choose from, you’re sure to find a Tork towel that fits your dispensers – and your budget. A hand towel with luxurious softness and performance for a restroom that lets customers know you care. A range of efficient, high-quality towels providing complete comfort and convenience. A standard range of reliable towels. Combines a soft experience with cost efficiency. 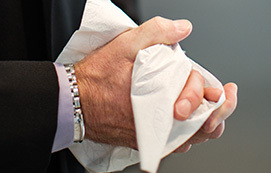 Tork towels were rated higher for performance and absorbency.3 Strong material and QuickDryTM design helps dry hands fast and thoroughly, without breaking apart. It represents the very nature of simple elegance. That’s why we’re offering a collection of high-end towels with the Leaf, to provide your customers a luxurious experience. Soft, strong and smart—our towels deliver complete comfort in a way you can feel good about. 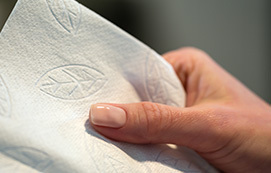 Best of all, customers who see and feel the Leaf on our towels know your business upholds the same high-end image. Because your restroom makes an impression. And impressions make the difference. With SCA, sustainability and better business go hand in hand to deliver solutions that help you achieve a greater return on your most important investments: people, planet and profit. That’s better business. Naturally. We try to make a difference you can see and feel. Our innovative dispensing solutions reduce consumption and labor, leading to more cost savings for you. Healthy practices create happier people. SCA solutions help attract and retain customers while boosting employee satisfaction and morale. We minimize environmental footprint along every step of the product lifecycle – from design and manufacturing to delivery and use. SCA is a global manufacturer of personal hygiene products, publication paper and forestry products, conducting business in more than 90 countries. 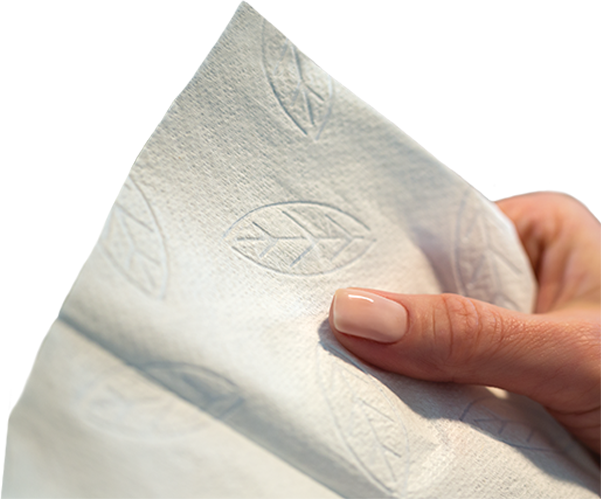 Our Tork brand of napkin, tissue, towel, soap, wiper products and dispensing solutions is the only away-from-home tissue brand 100% focused on the serving the B2B market in North America. Through customer understanding and expertise in hygiene and sustainability, we strive to create innovative solutions to help your business reduce cost, improve hygiene and lessen your impact on the environment. For more information, visit www.sca.com. If you’re not 100% satisfied, we’ll refund your purchase with up to $1000 in the towel product of your choice. No questions asked. A one-stop resource for tips, best practices and valuable insights to help you reach your business goals.